What Do Trout Eat in the Winter? In cold weather, rainbow trout will eat minnows. In winter, one of the difficulties fishermen face is determining exactly what bait trout will accept. In the winter, trout are more finicky when it comes to eating. However, various natural, synthetic and human foods are still effective for catching trout. With the proper knowledge of foods that trout like, you can catch a significant number of trout in the winter. A good bait to entice both young and mature trout is often mealworms, which are the larvae of young beetles. Mealworms are soft and chewy, and apparently tasty to trout. According to the Wisconsin Department of Natural Resources website, trout recognize mealworms as an all-natural food source; their squirming movements make this larva irresistible to fish. 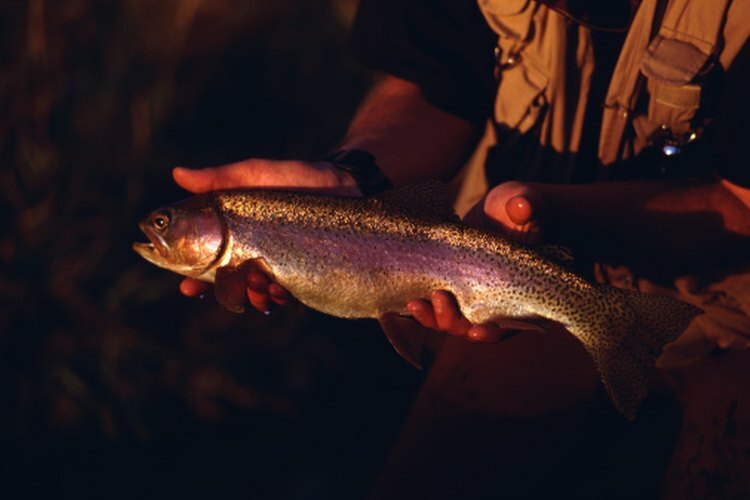 An effective method to catch trout is to use a tiny float, and several mealworms on a sharp hook. You should cast your line directly into open water and let the line drift; ultimately, a trout will come along and strike the mealworms. Trout will lash out at just about any small moving target in the water. This makes fishing live minnows effective for taking trout. A trout prefers a lively minnow, ranging from three to six inches in length. Trout will hit a fathead minnow wiggling at the end of a hook. Using a fathead in deep water can yield a hard strike from a hungry trout. Fishing minnows on a single hook with lightweight split shots can lure rainbow trout to strike as the baitfih drifts or swims in strong currents. In icy waters, use leeches to catch trout. Leeches thrive in cold water, and trout think of a leech as a human would a steak. While a leech is good bait for trout, earthworms are a far better bait, as are their larger cousins, night crawlers. A trout cannot resist seeing a fat worm squirming on the end of a hook. Many Wisconsin ice fishermen utilize live worms on their fishing lines to entice species of trout such as lake trout, rainbow and brown trout into striking. Berkley’s Power bait is brightly colored dough that releases a fishy smell. It comes in various colors including white, orange and green. Powerbait is manufactured from commercial feed pellets, the same food used in raising hatchery trout, according to Berkley. When using power bait, it is a good idea to use an ample amount to cover the hook. In cold water, the powerbait seals around the hook and floats in the water like a live baitfish. Velveeta cheese is a great bait for trout. It works well when rolled into a small ball and placed on a hook. Trout have a strong sense of smell, and the smell of Velveeta cheese will spread through the water. Trout may notice the yellowish/orange color of Velveeta and mistake it for hatchery feed. Thomas Ganio began writing in 2006 for the "Northern Virginia Daily," a community newspaper in Richmond, Va. As a freelance writer, he has also contributed to "The Maryland Springs Gazette" and the Parks and Recreation Department of Richmond County, Md. Ganio holds a Bachelor of Arts in social science and English from James Madison University. What Do Yellow Perch Eat?